This tutorial will try to explain how to integrate or embed a robot language interpreter into V-REP. The procedure is very similar in case you want to integrate an emulator (e.g. a specific microcontroller emulator) into V-REP. Extending V-REP's functionality requires most of the time the development of a plugin. Make sure you have read the tutorial on plugins , and the tutorial on external controllers before proceeding with this tutorial. The V-REP scene file related to this tutorial is located in V-REP's installation folder scenes\robotLanguageControl.ttt. You can find the plugin project files here, and the server application project files here. The MTB robot is an imaginary robot (MTB stands for Machine Type B), that will be controlled with an imaginary robot language. "IFBITGOTO y label": if bit at position y (1-32) in the robot input port is set, jump to "label"
"IFNBITGOTO y label": if bit at position y (1-32) in the robot input port is not set, jump to "label"
"GOTO label": jumps to "label"
The MTB plugin can act as intermediate for as many different languages as needed, also those that haven't been developed yet: the MTB plugin will simply launch the appropriate server depending on the used robot/language. If the robot language interpreter / controller crashes, V-REP won't crash, since the two are distinct and separate processes. receive the program code (i.e. 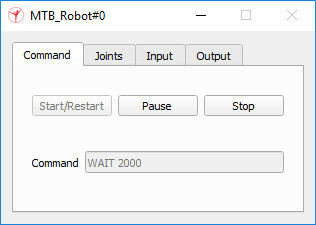 a buffer) from the MTB plugin, compile it, and initialize the robot controller. apply input signals, step through the program code (the step duration can be different from step to step), and return output signals and joint angles. Above custom UI is the user-interface of the MTB robot and can be fully customized. Should the MTB robot be copied, then its custom UI will also be copied. Next to being able to controlling the program execution state, the custom UI also displays current program line (Command) and the MTB's current joint values. The user can also change the robot's input port bits, and read the robot's output port bits. Input and output ports can be read and respectively written by the robot language program. Input and output ports can also be written and read by external devices (e.g. the robot's gripper or suction pad) by using appropriate function calls (see further below). There are two child scripts attached to the MTB_Robot and MTB_Robot#0 objects. They are in charge of handling the custom dialogs and communicating with the MTB plugin. Most code in the child scripts could be handled by the plugin too. Open the child script attached to one of the two MTB robot (e.g. with a double-click on the script icon next to the robot model in the scene hierarchy). At the top of the script, you will see the robot language code. Try to modify an MTB robot's program to have it perform a different movement sequence. Experiment a little bit. the actual robot language program is compiled and executed by the "mtbServer" application. That application also holds the MTB robot's state variables. For each MTB robot in the simulation scene, there will be an instance of the mtbServer application launched by the v_repExtMtb plugin. the v_repExtMtb plugin is in charge of providing custom Lua functions, and also launches the mtbServer application when needed, and communicates with it via socket communication. the child scripts attached to MTB_Robot and MTB_Robot#0 check whether the v_repExtMtb plugin is loaded, update the OpenGl-based custom UIs for each robot, and handle the communication with the plugin. Building the model of the robot. This includes importing CAD data, adding joints, etc. This step can be entirely done in V-REP. Writing a plugin to handle the new robot natively, i.e. to handle the new robot by interpreting its own robot language. Any language capable of accessing C-API functions and capable of being wrapped in a dll can be used to create the plugin (but c/c++ is preferred). The robot language interpreter could be directly embedded in the plugin, or launched as an external application (mtbServer) as is done in this tutorial. Writing a small child script responsible for handling custom dialogs and linking the robot with the plugin. This step can be entirely done in V-REP. The robot language interpreter should be able to be executed several times in parallel. This means that several interpreter instances should be supported, in order to support several identical, in-parallel operating robots. This can be handled the easiest by launching a new interpreter for each new robot, as is done in this tutorial. When writing any plugin, make sure that the plugin accesses V-REP's regular API only from the main thread (or from a thread created by V-REP)! The plugin can launch new threads, but in that case those new threads should not be used to access V-REP (they can however be used to communicate with a server application, to communicate with some hardware, to execute background calculations, etc.). Now let's have a look at the child script that is attached to the MTB robot. The code might seem quite long or complicated. However most functionality handled in the child script could also be directly handled in the plugin, making the child script much smaller/cleaner. The advantage in handling most functionality in the child script is that modifications can be performed without having to recompile the plugin! Checking whether the plugin was loaded. If not, an error message is output. Communicating with the plugin. This means that information is sent to and received from the MTB plugin with custom Lua functions. Applying the newly calculated joint values to the MTB robot model. This could also be handled in the MTB's plugin. Reacting to events on the custom dialogs, like button presses. Updating the state of the custom dialogs. simMTB.startServer: launches the server application (e.g. mtbServer) on the specified port, connects to it, and sends it the robot language code, the initial joint positions, and the initial velocities. In return, the function returns a server handle (if successful), and a message (usually a compilation error message). simMTB.step: steps through the robot language program with the specified timeStep, and returns a result value and a message (usually the code being currently executed). simMTB.getJoints: retrieves the current joint positions. 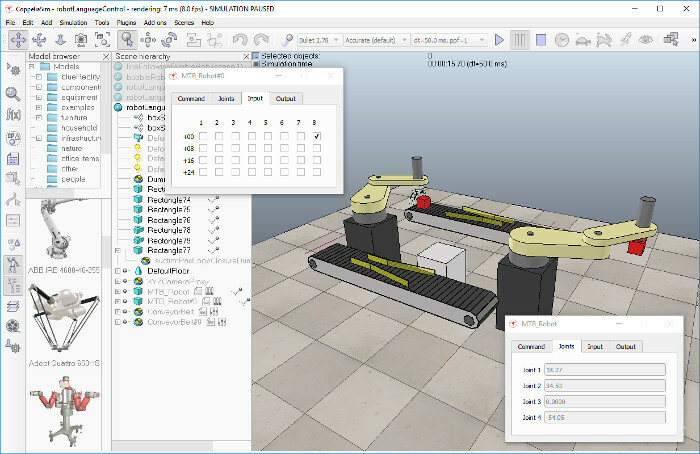 The joint positions are automatically updated when simMTB.step is called.